One thing that’s always bothered me though is the ceremony involved in consuming messages. Whether it’s RabbitMQ or Amazon SQS I’ve had to write some variation of a while(true) loop to keep checking the queue for any new messages. 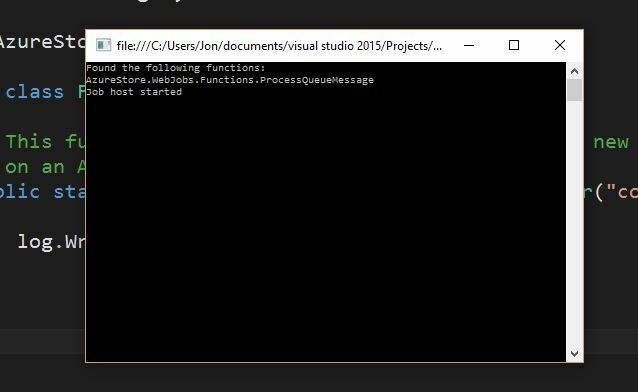 Azure Web Jobs can really simplify your message consuming code and finally get rid of those pesky loops! I opted to use storage queues instead of service bus as webjobs uses them “out of the box” and they’re easy to get started with. This code is simple enough. I need a queue so this code creates one (if it doesn’t already exist) then pushes a message onto it. The real fun starts when we consume these messages using webjobs. 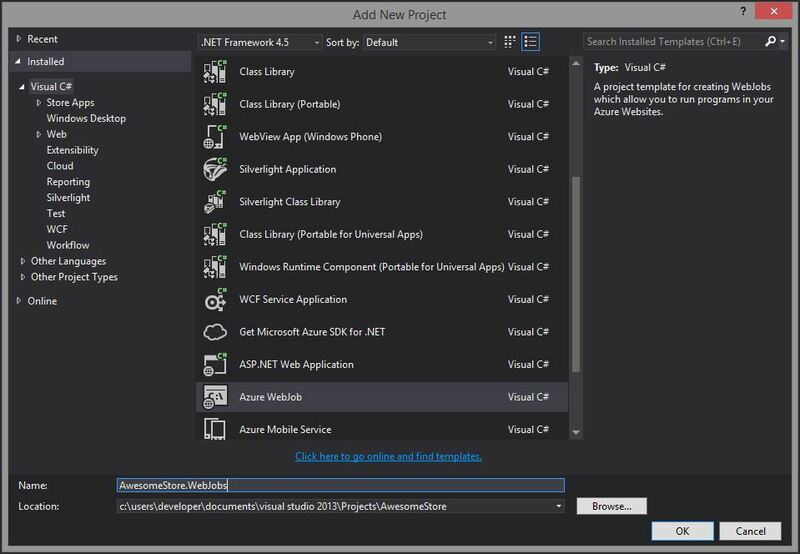 There’s a webjobs project template available in Visual Studio which adds a webjobs project to any existing solution. Keeping the webjobs project with your web site makes it easy to manage. This boilerplate code in program.cs tells us what to do next. I already had a storage account set up in Azure (I used it earlier when sending messages) so I set that in app.config for both AzureWebJobsDashboard and AzureWebJobsStorage. A word to the wise, you can’t use the development storage (emulator) for webjobs so don’t even try (I found out the hard way when my first attempt blew up). With the connection sorted I turned to receiving messages when they’re pushed onto the queue. This is brilliant. I love the fact that the message is automatically deserialised. It’s easy to test too because the webjobs.exe can run locally as well as being deployed to the cloud. So how do you deploy this thing to Azure? 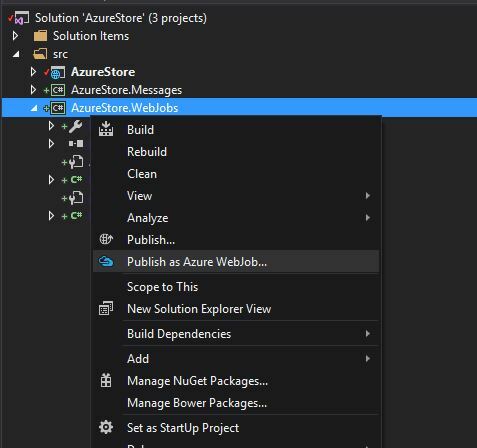 At first I was concerned that publishing to an existing web site on Azure might overwrite the site with the WebJob but using the Publish as Azure WebJob menu option in Visual Studio deploys it alongside your web app. When you view the app in the Azure Portal there is a link to view the WebJob and it’s dashboard. My first attempt to view the dashboard didn’t go so well when I got this error. For some reason Microsoft feel the need to tell you this twice. This is easy to correct, you just need to set your storage connection strings for your web app in the portal (via settings). And that’s that. You might have noticed that I actually have two web job instances up and running for this web app. If you’re thinking about smaller, more focused services (microservices) this is useful as you can split up your background tasks into their own webjobs. Just add more webjobs project to your solution. 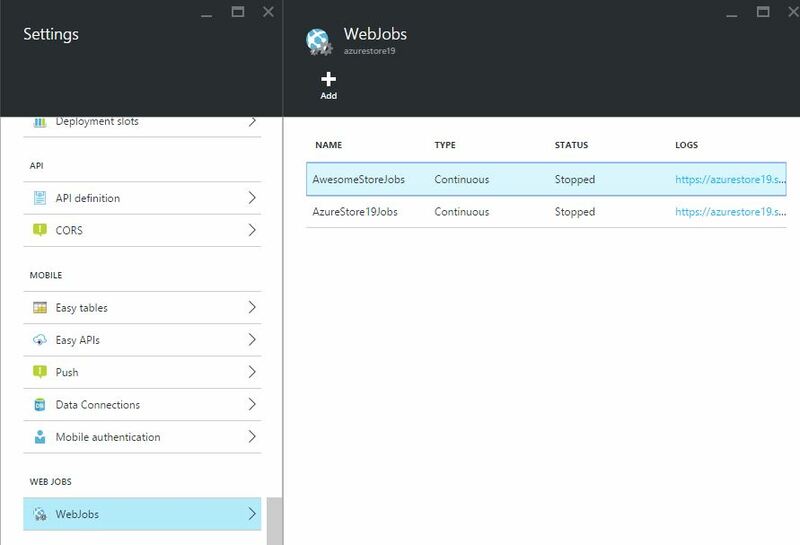 There’s a lot more that can be done with Azure Web Jobs, not least running scheduled tasks and using Service Bus to perform multiple actions from the same message. Finally I’d love to hear from you, what do you want to know about web jobs, If you’ve used them what challenges have you faced?